I am finding different results between the two when conducting a bayesian repeated measures anova, and I'm not sure if I'm mis-specifying it (in JASP or BayesFactor) or interpreting the output incorrectly. Example experiment: Subjects are assigned conditions (treatment vs. control) and take two tests (science and math). I specified both ANOVAs the same way in JASP, so I'm not sure what I'm doing wrong! The difference in the analysis is that JASP compares all models to the Null model that includes subject. 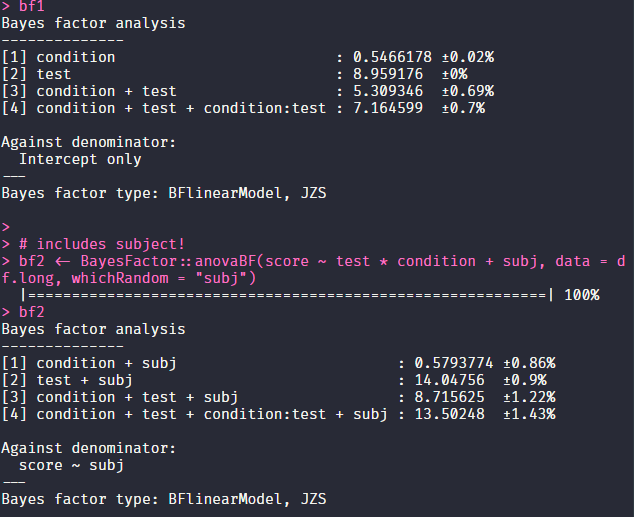 To replicate the results in R you would have to include "subj" into the model as well. In your example, it wasn't included which you can see from the "Against denominator: Intercept only"
# does not include subject! There is still a small numerical discrepancy, but that is nothing to worry about. I hope that solves the issue! awesome, thank you @vandenman for the help!